Investment casters worldwide rely on Blasch high-performance ProCaster ceramic crucibles specifically engineered for coreless induction furnaces up to 5,000 pound capacity. With crucibles available in a variety of compositions, Blasch engineers assist casters in achieving financial performance objectives. Foundries count on premium quality Blasch ProCaster™ high alumina crucibles to perform the same each and every campaign allowing them to extend campaigns and reduce downstream quality issues resulting in lower scrap and rework costs. Blasch also offers a host / liner multi-use system and bottom pour configurations which provide unique solutions for investment casters. Blasch ProCaster™ bottom pour crucible systems allow slag reduced pouring. By combining a crucible, nozzle and an actuated stopper rod configuration, Blasch can create a precision mated system to provide accurate bottom pouring from an induction furnace configuration. Utilizing the precision tolerance capability that Blasch ceramic can provide, allows nozzle and rod mating surfaces that accurately meter and perform for pour after pour. High alumina ProCaster crucibles optimize metal purity and maximize campaign life. 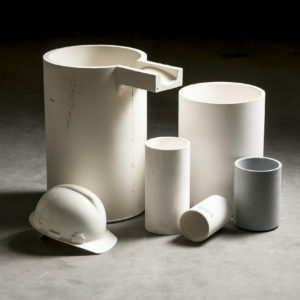 Find out more about our ProCaster line of high-performance ceramic crucibles.